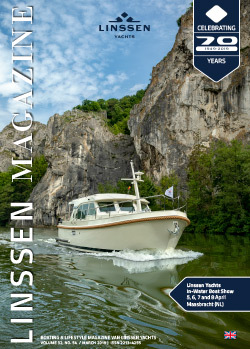 The Linssen Variotop® is the unique fully automatic folding roof that combines the interior helmsman’s position, the exterior helmsman’s position, bimini and flybridge to produce a single comfortable wheelhouse. You can stand or sit at the convenient helmsman’s position. You can sit on the extremely comfortable two-person helmsman’s bench. This electrically operated bench can be raised or lowered or moved forwards or backwards at the single press of a button. It is important that you always select a position that gives you a safe feeling and offers the best all-round vision. If you have opened the Variotop® and lowered the bench as far as possible, you will be comfortably sheltered by the front windows. In the bench’s highest position, you can enjoy the fresh breeze. Your passengers can keep you company from a second comfortable bench on the port side. By opening the Linssen Variotop® and the hinged doors of the wheelhouse, you create oceans of space on board. The interior and exterior are joined together and the wheelhouse and aft deck are combined to create one large outdoor area. Even if the Variotop® is closed, you can still create this feeling of spaciousness thanks to the two hinged doors that can open 180 degrees. The huge aft deck that results has a length of more than four metres. We predict that you will spend many hours here. By placing one central helmsman’s position under the Variotop®, we have created extra space for you in the saloon. The space that was previously taken up by the customary interior helmsman’s position has been used for even more comfort on board. A trip on a Grand Sturdy Variotop® means enjoyment in itself. But if the sun is shining too, it will be even more pleasant. There are several places on board where you can enjoy the sun. However, we understand that you will also wish to benefit from the sun at the helmsman’s position. The Variotop® makes that possible. With a single press of a button, you open the wheelhouse roof and within a few seconds you are in the open air and steering your Grand Sturdy 500 AC from a flybridge. If the sun’s rays are too strong and you need to cool off, you can close the Variotop® for 80%. This means that you are no longer sitting in the sun, but there is a pleasant breeze blowing through the opening. • with the adjacent spacious galley that offers all required equipment as standard features, such as a refrigerator, an oven-grill-microwave combination, a dishwasher, a four zone induction hob, an extraction hood with exterior discharge, a separated waste bin, a stainless steel sink, a practical ‘magic corner’, a spacious and modern stylish Corian worktop and finally a coffee bar with a fully automatic coffee machine. In other words: 100% complete! The forward compartment has two perfect guest rooms, one with a freestanding double bed and one with two single beds that can easily be converted into a spacious double bed. These two guest rooms have a separate shower and toilet space available. The aft compartment is the owner’s domain. The splendour that this space radiates thanks to its versatile layout and well-considered details and material choice makes it an ideal place to be. The broad 1.80 metre bed, the abundant storage possibilities with cupboards, shelves and drawers, the rear exterior view, the cosy seating on the starboard side, the versatile and chic dressing table on the mid-forward side, the minibar with glasses and cooling, a flush built-in TV, a very spacious shower and a high-quality bathroom complete the picture. The interior styling has been brought into line with the elegant and timeless lines of the exterior. The styling is a product of many years of yacht building passion converted by the Linssen Design Team into this new standard. By combining various disciplines within the team such as interior prototyping, 3D design techniques, market research, materials knowledge, practical yacht building experience, interior architecture and nautical technology, a level of design technology is achieved that is way ahead of many larger yachts. What is impressive is the great harmony but also the contrasts within the interior: variation brought together in one total styling. To add the required individual touch, colour impressions have been combined in close cooperation with the interior architect based on the nautical themes white, glacier, sand, grey, marine and aqua, which provide the boat with different characteristics. The different colour impressions can also be applied to the exterior, more or less based on the same themes, by using colour variations in coating, canvas and cushions. The new interior is characterised by extensive detailing in the styling, choice of materials and colours. The combination of contrast resulting from the many details on the one hand and the total harmony on the other has resulted in an exceptional boat in its class. A focus on the interior functional details is also important. Countless storage possibilities in the form of shelves, cupboards and drawers ensure a practical boat. However, the various leather-covered storage spaces close to the beds, bench and helmsman’s position give the interior an exceptionally luxurious feeling. In short, almost 70 years of yacht building experience brought together in our new flagship.